Physical barrier, typically incorporated during construction. Steel mesh and sands of particular sizes may perform effectively as physical barriers. Termite related pesticides (termiticides) are licensed/registered by EPA for use in strict accordance with label directions. In most cases, termiticide application can only be properly performed by a trained pest management professional Approved treatments include: Liquid soil-applied termiticides, termite baits, building materials, Wood treatments impregnated with termiticides. 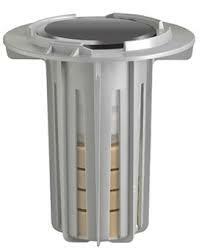 Bait systems help reduce the overall use of insecticides and their impact on human health and the environment. These systems rely on cellulose baits that contain a slow-acting insecticide. Borates (boron related minerals and silicates that occur in nature) are commonly used to protect wood as a spray on application during new home construction or repair. Borates provide a shell of protection around treated wood. A limitation of any topically applied borate is that it must be applied to bare wood. Anything on the surface that inhibits the absorption of water into the wood. Thus the borate solution remains on the surface and no protection will be imparted to the wood itself. Cockroaches have been around since the dinosaurs. They have six legs, wings, and antenna. They can run up to three miles an hour. They range in size and color, and their shed skin contains allergens that can cause asthma. Cockroaches and their droppings cause several health concerns. Cockroach, eggs, saliva, feces and outer covering may be left behind on surfaces. Such Cockroach materials, which contain substances that are allergenic to humans, may trigger an asthma attack especially those with asthma or other respiratory conditions. Within and on the surface of their bodies, cockroaches carry bacteria that can cause salmonella, staphlylococcus and streptococus if deposited in food. Cockroaches live outdoors but occasionally come inside. They need food, shelter, and water. Eliminate these elements as much as possible and infestations will be drastically reduced. There are 3 main species of Cockroach in the United States. widespread and can be found in many indoor environments. Within these areas, the cockroaches prefer sites close to moisture and food, making them common pests in: kitchens, bathrooms and food-storage areas. requires less moisture than other cockroaches. It lives indoors, but prefers warm environments and often lives near electrical appliances. The Brown Banded cockroach is more prevalent in homes, apartments, hotels and hospital rooms than in restaurants or stores. Evidence of this cockroach may be found: behind pictures, in furniture, the underside of chairs and tables, in upper kitchen cabinets, on the upper shelves of closets and pantries. one of the largest cockroaches in the Northeast. This cockroach prefers dark, moist sites where it feeds on decaying organic matter. Sites include: basements, kitchens, clothes hampers, drains, bathroom plumbing or sewers. Active at night—if you see them during the day, you have a heavy infestation. Live in cracks and crevices near food. Prefer to crawl along edges of counters or floors—rarely venture into the middle of rooms. Scatter when they sense vibration such as the sound of pesticide sprays. Locate hiding places by putting sticky traps (such as a roach motel) on the floor next to walls and under kitchen appliances. Use a flashlight and small mirror to check behind or under cabinets and appliances. Flush out roaches with a hair dryer not aerosol pesticide. Household chemicals like sodium bicarbonate (baking soda) have been suggested, without evidence for their effectiveness. Garden herbs including bay, catnip, mint, cucumber, and garlic have been proposed as repellents. Poisoned bait containing hydramethylnon or fipronil, and boric acid powder is effective on adults. Baits with egg killers are also quite effective at reducing the cockroach population. Insecticides containing deltamethrin or pyrethrin are very effective. Cockroaches can be trapped in a deep, smooth-walled jar baited with food inside, placed so that cockroaches can reach the opening. The method works with the American cockroach, but less so with the German cockroach. Be aware: Cockroaches are better at hiding than novices are at finding them. In addition, their eggs are naturally protected from many easily available insecticides. Without special equipment, materials and know-how, cockroach control can be a losing battle. In most cases, significant cockroach removal should only be properly performed by a trained pest management professional. Here is a discussion on how to proceed. Most pest control issues can wait a few days so take time to select a competent, reasonably priced company. Obtain several estimates. Estimates are usually free. . Be aware termite control can require several hundred gallons of diluted insecticide so per gallon estimates are somewhat open ended. The Pest Control Service must have at least one certified, licensed commercial pesticide applicator in the proper service category. Other company applicators must be certified applicators or licensed technicians under the direct supervision of an certified applicator. Licenses may be verified by calling your State Department of Agriculture or equivalent. Get a copy of company pest control license, copies of the labels for all pesticides used and the rates at which they will be applied. Pesticides are inherently toxic and may cause health problems and/or damage to the environment if used in a manner inconsistent with the label directions. Certain pesticides may pose greater risks than others. Generally, it is customary for termite control work to be guaranteed from one to five years. Bed bugs are parasitic insects that feed exclusively on blood. The common bed bug, is the best known as it prefers to feed on human blood; species specialize in other animals. The term “bed bug” is the result of their preferred habitat: warm houses usually near or inside beds and bedding. Bed bugs are generally, not exclusively, nocturnal. In most cases, they feed on people without being noticed. The bugs can survive a wide range of temperatures and atmospheric conditions. Adult bed bugs are light brown to reddish-brown, flat, oval, and have no hind wings. Baby bed bugs are translucent and become browner as they reach maturity. A baby bug that has just had a blood meal has a bright red, translucent abdomen, fading to brown over the next several hours, and to opaque black within two days as the meal is digested. In warm conditions bed bugs generally feed every 5 – 10 days. Adults can survive for about five months without food. New baby bed bugs can survive without blood meal for several weeks. Bed bugs usually congregate once established. The bugs spend only a little total time physically attached to hosts. Several unhealthy effects may be caused by bed bug bites, including: skin rashes, psychological effects, and allergic symptoms. Bed bugs are not known to transmit any microorganism that can cause disease. • The peak time for feeding is between midnight and 5 AM. Takes about 5 - 10 min. • They find their host by seeking out human body heat and carbon dioxide from the breath. • A bedbug pierces the skin of its host with its mouth part. It injects saliva (part anesthetic and anticoagulant) to reduce host’s feeling and allow the blood flows freely Bites are not noticeable until after the skin reaction has occurred. It can take up to 14 days for bites to appear. • Bedbugs can only reproduce when they have reached maturity. Bed bug infestation detection comprises locating bed bugs and the occurrence of expected symptoms. Bed bug bites may lead to a range of skin indicators from no visible effects to noticeable blisters. Treatment involves the elimination of the insect (and its eggs) and handling the bite symptoms. The most likely skin indicator is itchy red marks or bumps on your body. Such bites are grouped or clustered in a certain area. They usually show up in vertical lines down your arms or legs. In addition bites could appear on hands and face. • Red spots on sheets from crushing them in your sleep. • Clutter can provide good hiding places and make bugs difficult to treat. Bed Bug Treatment: Bed bugs are extremely difficult to get rid of. This frequently requires a combination of non-pesticide approaches and the use of insecticides. It is advisable to bring in a pest control professional. Mechanical approaches - such as vacuuming up the insects and heat-treating or wrapping mattresses, are effective. Predators - Natural enemies of bed bugs include: the “masked bed bug hunter” insect, cockroaches, ants, spiders, mites, and the “house centipede”. However, biological pest control is not considered practical for bed bugs in houses. Do it Yourself - Environmental Protection Agency (EPA) has developed a search tool that can help you choose an EPA-registered bed bug product that meets your needs. The products listed in this search tool are those that can be purchased by any consumer. There are other products that are only available for purchase and use by specially trained individuals. Find the tool here. • Deal with a qualified and licensed pest management company. Call your state pest control regulatory agency for information about the status of pest management companies. In most states, the regulatory agency is the State Department of Agriculture. You also can check out companies with your state Attorney General, local consumer protection agency, or an internet search engine. • Ask friends and neighbors to recommend pest control companies they have used successfully for bed bugs and how satisfied they were with the service. You can do this online through a community bulletin board or neighborhood listserv. • Before you sign a contract, get details on the extent of the infestation, the proposed work plan, and the number of visits required and anticipated to solve the problem. A reputable company will inspect your property before quoting you a price or beginning any pesticide application. The company also should give you a written inspection report, and a plan for preparing for treatment and preventing further infestation. • If you get a written "guarantee," look for what it covers, how long it lasts, what you must do to keep it in force, and what is required for continuing control, prevention, and management. by over 6 feet tall...over 200 square inches of mosquito, fly and other pest access. 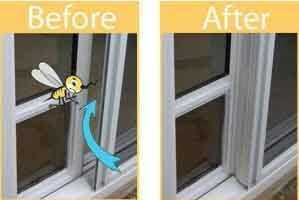 The Bug Warden blocks bugs from entering the bug gap by adhering to the side of the exterior face of the patio pet door and extending out a soft flexible material to provide a bug blocking seal with your screen door.